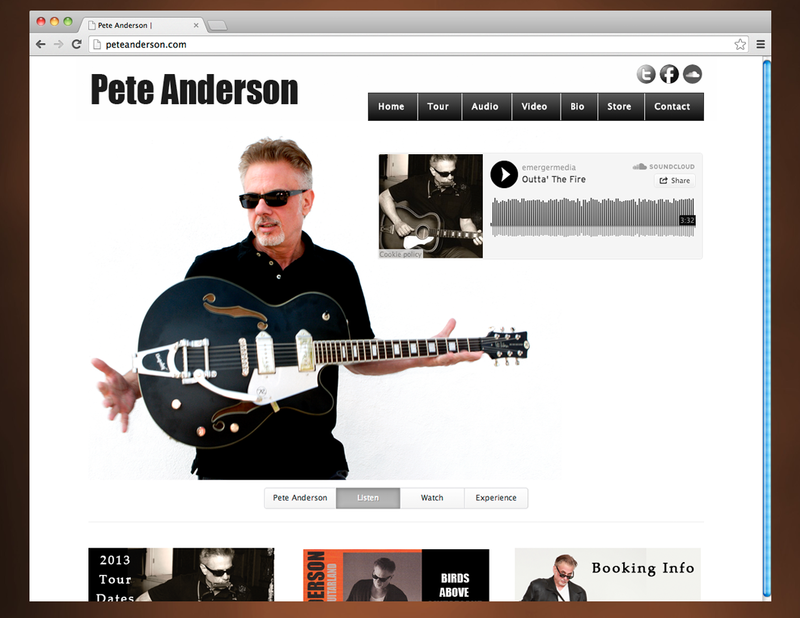 Grammy award winning guitarist and producer Pete Anderson needed a new web presence to highlight his latest album “Birds Above Guitarland” and the corresponding North American tour. Emerger Media built a website that features audio streaming, a list of tour dates and an eCommerce solution where visitors can purchase his albums. We also built an interactive video gallery that highlights befitting Pete’s career as a solo artist and producer to artists such as Roy Orbison, kd lang and Dwight Yoakam. We needed a website that would highlight Pete’s new album and North American tour while also reflecting his career as a guitarist and producer and his contributions to music with his label Little Dog Records. With Emerger Media we found a partner that developed a website that was rich with audio, video and image galleries while also providing visitors with a calendar of Pete’s tour dates and an easy way to stay connected by joining our mailing list. Working with Emerger Media has been a great experience and we couldn’t be happier.